Does this picture prove that? I’m gonna need some help here. I can’t tell what anything is. your child will thank you for posting his first nudie pic on the internets. Could we get an “Ultrasound for Dummies” on this one? I can’t tell what anything is either. There’s still room for doubt in my mind. 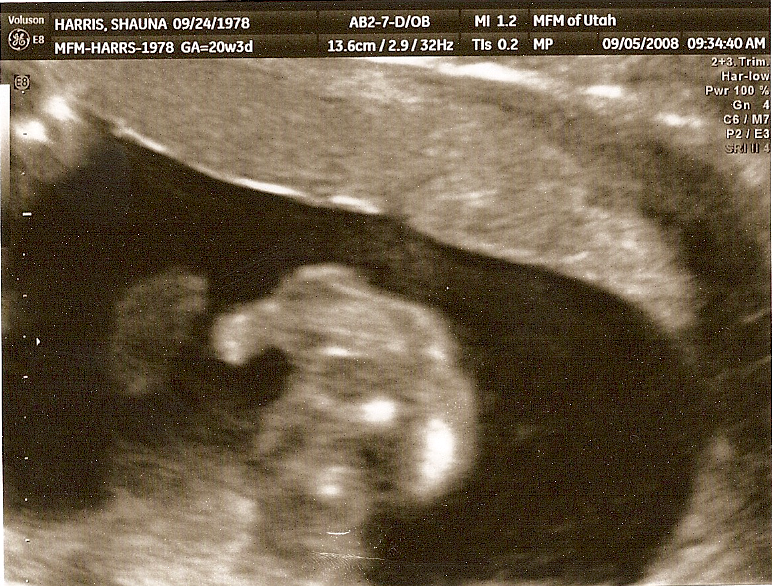 I not only have room for doubt that it’s a boy, but I have room for doubt that it’s human. I third the “Ultrasound for Dummies” request. A rather immodest pose, but that’s also how our first boy looked in his ultrasound. A boy how exciting! We were positive BEFORE the Ultrasound that we were having a boy. The Doc, says girl, but you really never know huh. When is Shauna due? Congrats! okay folks….I spun Shauna ’round for a few minutes on this one…I kept saying girl, ’til I took a third, and fourth look at the pic. See, this lil’ dude wiggles…ALOT! So the image is blurred. Here’s what you do… Look on the left hand side of the picture, about an inch or two in. There is a very distinct, although faint picture of his little foot. Look DIRECTLY below the arch……that is his manliness in all of its glory!!!! I also watched the dvd of the event, and although the tech says she can’t see anything, it was pretty clear about the ‘parts’ when she was ‘trying’ to move his legs out of the way…. (hint…they weren’t in the way…) So congrats to Shauna and Jesse on a fine healthy looking boy!!! OH….and my dibs are on a rather large mass of red curls on the head!!! Jo: She’s due on Jan 20. Bill: The Italian genes are really REALLY strong so I’m thinking we’d be lucky if we got anything but my dark brown hair. Congrats to you both! It looks like a big blur to me, but after reading the comments, I’m going to have to take a second look.